Rahul Sharad Dravid India’s ‘The Wall ’ has finally hung up his boots after an illustrious career lasting over a decade. He has been a great servant for Indian cricket and deserves all accolades that he is entitled to. What amazed me is the way he carried out himself every time he walked on to the pitch. He never showed any emotions and always let his bat do the talking. A man with flawless batting technique and great determination, Jammy indeed has been a gentleman. He has been India’s ‘go to ‘man ever since he made his debut way back in 1996.He has opened the batting, kept behind wickets and even bowled at times. 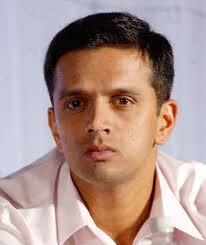 ‘When the going gets tough, the tough gets going’ best describes Dravid. There has never been an occasion where he hasn’t given his 100%. Mr.dependable has led India to great victories ranging from famous Calcutta test against Australia to a commendable win against the same opposition in their own backyard in Adelaide. He could be next to Sachin Tendulkar in terms of number of test runs but in terms of commitment Rahul stays far ahead of anybody else in Indian cricket. Despite Dravid being so humble, he was never spared by his critics. He was initially criticized for being a slow player when it came to one day cricket. Dravid, a man who always lets his cricket do the talking proved his potential even as a one day player scoring over a whooping 10,000 runs silencing all his critics. Dravid captained India in 2007 WC where India failed to qualify from group stages making it India’s worst ever performance in WCs. Dravid was not only a great man on the field but also off the field. The speech he gave on the status of test cricket in present times and his ways to improve it was also something that caught the eyes of the listeners. Dravid has always played second fiddle to Sachin, Sourav and Laxman. He never cared for personal glory and always kept his country first. A commentator once told ‘if Dravid wasn’t from India, he would have been as famous as Sachin and it was because of this great man that all his performances have been overshadowed’. But Jammy never worried about number of runs he scored or the accolades, it was the number of victories under his belt that mattered to him the most. Dravid you are indeed a great servant to Indian cricket and a warrior in your own terms. You have inspired many young hearts who aspire to take cricket as a career. You might have retired but your legacy still remains. 2nd person: If Sachin is God, then Saurav is next to God on the Off side. 3rd person: Then Laxman is the God of 4th innings..
4th person: When the doors of the temple are closed ,even the Gods are behind "The Wall". keep life as simple as possible.Nothing is our's,even the air we breathe in.